It's that time of year again, and as well as all the other usual festive tradition, many people like to dust off their favourite Christmas specials. A lot of these specials, whether one-offs or part of an ongoing series have become enduring favourites that people love to watch year after year. So don your favourite festive jumper and join us as we look at some of the greatest animated Christmas specials ever made. The Simpsons has been running for so long at this point, that it has had many Christmas episodes, but we're talking about the very first one. Not only the first Christmas episode, but actually the first episode full-stop, the first Christmas special was the pilot for the series proper, first broadcast 25 years ago this month. Not only did it introduce the world to animation's first family, it also introduced the Simpsons clan to their beloved family pooch Santa's Little Helper. Trust Trey Parker and Matt Stone to create a particularly hilarious spin on the Holiday special. Dealing with Kyle's feelings surrounding his Jewish identity and feeling left out at Christmas, it deals with some real issues. But this is South Park so it also features a talking poo, named Mr Hankey. Juvenile it may be, but it's also very very funny and this season one episode remains unsurpassed as the best South Park Christmas episode to this day. Forget the wretched Jim Carrey movie, the definitive screen version of the Grinch remains the 1966 original. The legendary Chuck Jones directed this faithful adaptation of the Dr Seuss favourite, starring the vocal talents of Boris Karloff. Taking Seuss's memorable story and adding songs that have become classics in their own right, it's a wonderful adaptation of the much loved yarn. The success of the special lead to Chuck Jones adapting another Seuss works Horton Hears A Who the following year. This stop-motion classic has been charming audiences for generations, first airing 50 years ago in 1964. The first of many stop-motion Christmas specials from Rankin/Bass, for many people in the US particularly this is the defining animated Holiday special. What many people don't know however, is that this- along with many other Rankin/Bass works- was actually animated in Japan. This live-action cult sit-com took its first step into animation in this Christmas special from its first season. In a stop-motion tribute to Rankin/Bass classics, fan-favourite character Abed works through his Christmas-based issues in animated form. It's smartly written, very funny and filled with real heart, no wonder it's one of the best-loved episodes of this excellent series. Matt Groening's other animated sit-com has its own unique spin on the Christmas in tradition. Defrosted delivery boy Phillip J Fry discovers that in the 31st century Christmas is a time of terror, due to a haywire Robot Santa. His circuits got fried and now everyone is on the naughty list... and this Santa ain't so jolly. 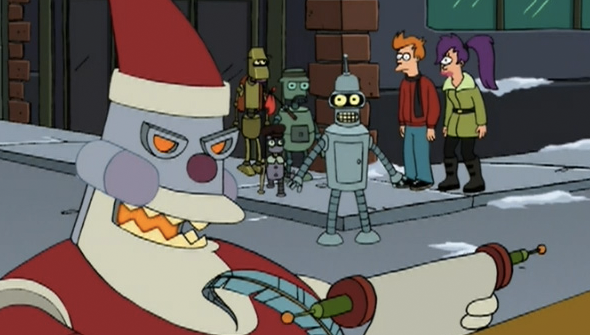 In his first appearance Robot Santa was voiced by none other than the incomparable John Goodman. Perhaps the one special that can give Rankin/Bass's festive specials a run for their money in terms of defining the season for many. Originally broadcast in 1965, this has - impressively- been broadcast every year since. Adapted from the classic Charles M Shultz newspaper strips, this was the first screen outing for Charlie Brown, Snoopy and company. Given how closely associated with Christmas Charlie Brown has become, the decision to release 2015's Blue Sky Peanuts movie adaptation in the Holiday period seems like a masterstroke. It was always going to happen, but it's surprising it took so long for Scrooge McDuck to appear in an adaptation of the Charles Dickens classic. Featuring Mickey Mouse in the Bob Cratchett role, this short was actually released in cinemas back in 1983. Like the later Muppets version, this is surprisingly faithful to the original source material, and not toned down for the younger audience. He-Man and She-ra: A Christmas Special. When you think Christmas Special, who doesn't instantly think He-Man and She-Ra? OK, pretty much everyone, but this 1980's full-length special is cheesy fun none-the-less. The plot that sees He-Man's nemesis Skeletor crash-land on Earth where he meets a couple of rosy-cheeked urchins who teach him the True Spirit Of Christmas.